On September 27 Holly Tucker from the Dallas office of Deloitte presented on the topic of "Forensic Accounting." This topic seemed especially interesting for all those attending. It was an outstanding presentation. 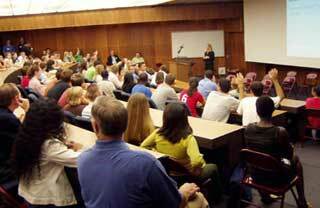 Perhaps the largest number ever of students and professional guests attended this meeting. You should plan to be at the next meeting. You never know what you're missing! Partner Kathy Gates and other professionals (ORU alumni) from the Tulsa office of Ernst & Young presented "Assurance Services" on September 20. 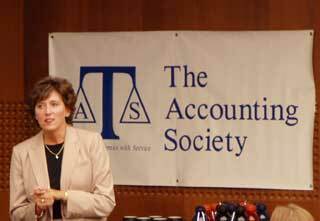 This meeting was extremely well attended, provided an excellent overview of the accounting profession, and great information about E & Y. We are off to a great start this year. 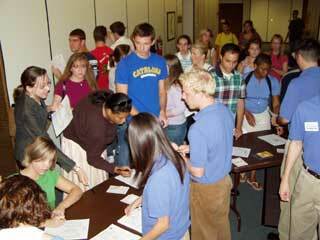 A significant number of student joined TAS at our first meeting before Club Rush. 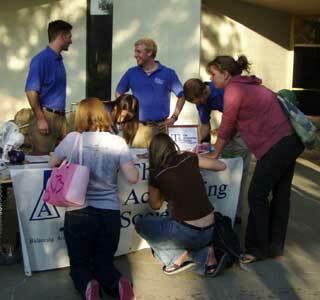 We had a great time at Club Rush, and others continued to join at our second meeting. We are pleased to announce we now have the largest number of members EVER!!! Thanks to all of you who have joined; we are very pleased with the interest you have expressed. To others we continue to extend our invitation for membership and participation. Annual dues are $15; individual meetings are $3 for non-members. There's never been a better time to join TAS!!! Contact any officer or advisor about becoming a member or sign up at any meeting!